When staining concrete we first test for sealers already in the surface. If your concrete is already sealed it must be removed physically. Unfortunately no sealer can be properly removed with chemicals or cleaners. We then make sure the concrete is clean and if necessary we power wash the surface. We then use a mild etch to open the pores of the concrete and wash it clean. If the concrete is fresh (30 days after it has been pored) then no etch is needed just a good power washing. Now that the cement is prepared we can apply Createastain to it, using different methods to achieve the faux finish we want to achieve or apply in solid colors. Creativity is the key, and many different looks can be achieved. We let the surface dry over night and then the next day we apply a wet look or satin sealer to finish the job. The surface can be walked on after 16 to 24 hours, depending on temperature and humidity. We allow 72 hours to cure completely before automotive traffic or heavy objects are to be used on the stained surface. New Stucco must be dried for 5 days before applying stain. We apply stain using a spray system and the darker the color you want the more coats we can apply. Two coats are suggested. Createastain is very durable and with 100% UV protection it will outlast your average paint used on stucco. Since the stucco will not get heavy traffic use no sealer is needed. 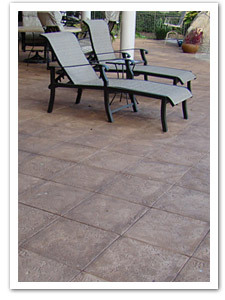 Check out our Concrete & Stucco gallery, then give us a call for a free estimate.